I personally prefer mask sheet to peel off mask at times where I'm lazy to do the extra hard work. sure, peel off masks felt more rewarding, but sometimes for the sake of slacking off, sheet masks are a time-saver. I bought this mask at TheFaceShop (I don't know why there are not spaces in between) for Rp22500,- and received a free mask upon my second purchase. So, it's a promotion from Indosat "Buy 2, Get 3" for sheet masks. I got the Tea Tree and Bergamont, Vita K, Vita B and Mung bean mask. They are all sheet masks with different ingredients and uses. Let's review the Vita B now. 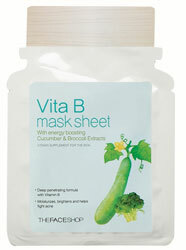 - Formulated with Vitamin B and extracts of cucumber and broccoli, this vitamin is drenched sheet mask gives the skin an energy boost to fight stress. - Vitamin B moisturizes, brightens skin tone and helps fights acne. Phytolex Nanoliposom is a composite of Ceramide and natural plant extracts of Mung Bean, White Birch and Rumex Crispus L.
After around 30 minutes, my face turns into an oil mine. Overall, I would not repurchase this product again since I really hate the STICKY feeling after I removed the mask. I only use this once and am not planning on using them again. I find that it is a really bothersome product to use because of the stickiness and oily feeling I have on my face after usage.